IBM® Tivoli® Storage Productivity Center for Replication provides support for the advanced copy services capabilities on the DS8000® and DS6000™, in addition to the support for SAN Volume Controller. This support focuses on automating administration and configuration of these services, operational control (starting, suspending, resuming) copy services tasks, and monitoring and managing the copy services sessions. In addition to the support for FlashCopy® and Metro Mirror, Tivoli Storage Productivity Center for Replication supports Global Mirror on the DS8000, and SAN Volume hardware platforms. Advanced disaster recovery functions are also supported with failover/failback (planned and unplanned) from a primary site to a disaster recovery site. A new product, IBM Tivoli Storage Productivity Center for Replication Basic Edition for System z® enables Basic HyperSwap® on z/OS®, which allows the management of disk replication services using an intuitive GUI on z/OS systems. Tivoli Storage Productivity Center for Replication also can monitor the performance of the copy services that provide a measurement of the amount of replication and the amount of time that is required to complete the replication operations. 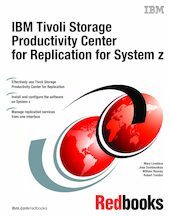 This IBM Redbooks® publication provides the information you need to install Tivoli Storage Productivity Center for Replication V5.1, and create and manage replication sessions on a z/OS platform. Scenarios are provided that document the work performed in our laboratory setting, using the GUI and CLI.